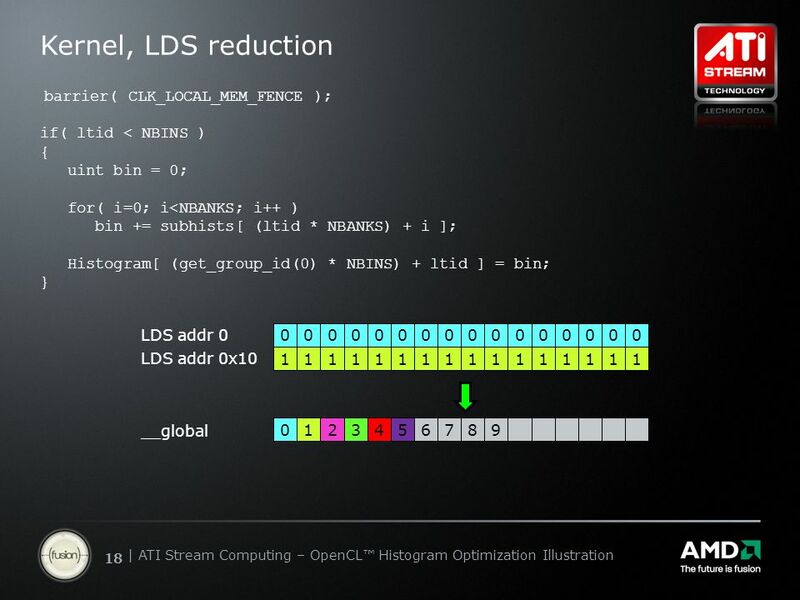 ATI Stream Computing OpenCL™ Histogram Optimization Illustration Marc Romankewicz April 5, 2010. 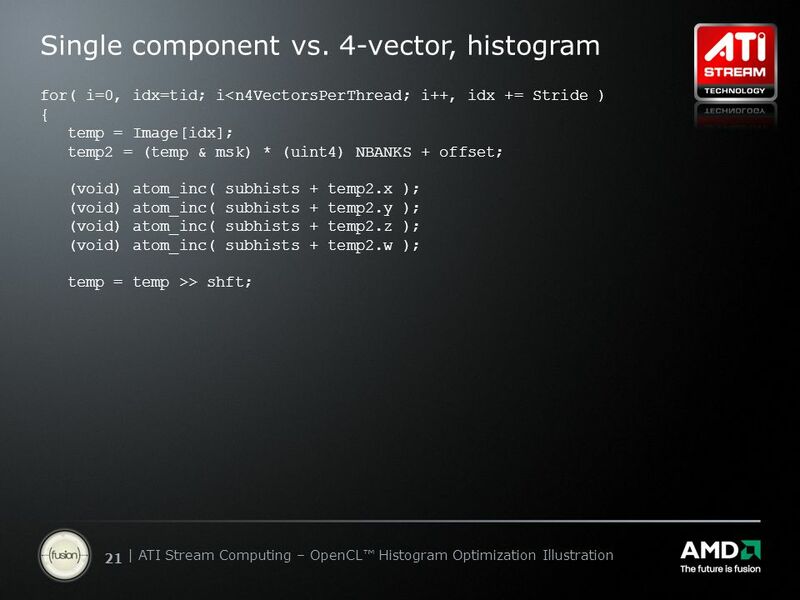 20 | ATI Stream Computing Update | Confidential 20 | ATI Stream Computing – OpenCL™ Histogram Optimization Illustration Single component vs. 4-vector 4-vectors work best for many cases. 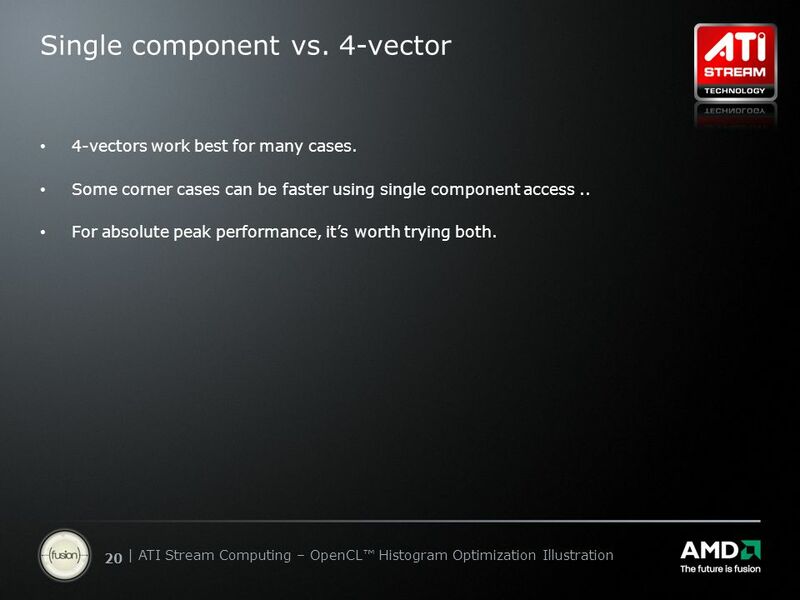 Some corner cases can be faster using single component access.. For absolute peak performance, it’s worth trying both. 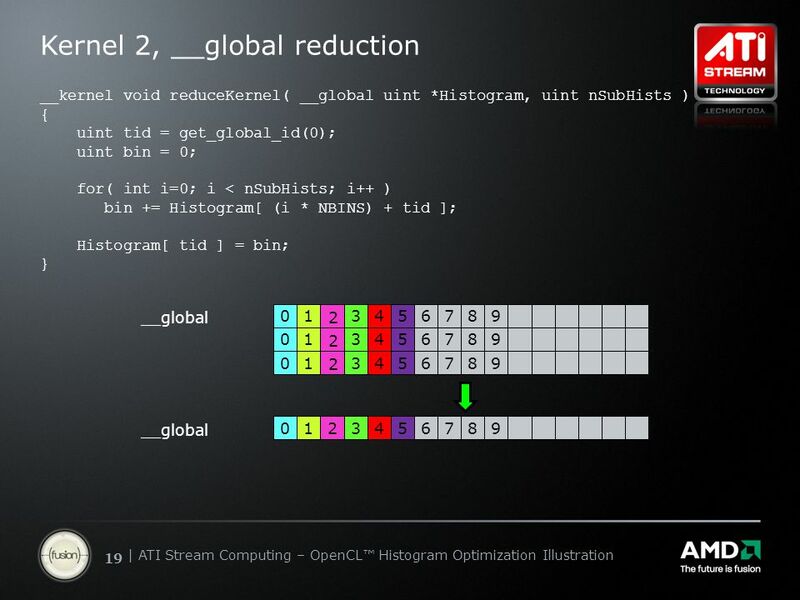 23 | ATI Stream Computing Update | Confidential 23 | ATI Stream Computing – OpenCL™ Histogram Optimization Illustration Disclaimer & Attribution DISCLAIMER The information presented in this document is for informational purposes only and may contain technical inaccuracies, omissions and typographical errors. The information contained herein is subject to change and may be rendered inaccurate for many reasons, including but not limited to product and roadmap changes, component and motherboard version changes, new model and/or product releases, product differences between differing manufacturers, software changes, BIOS flashes, firmware upgrades, or the like. 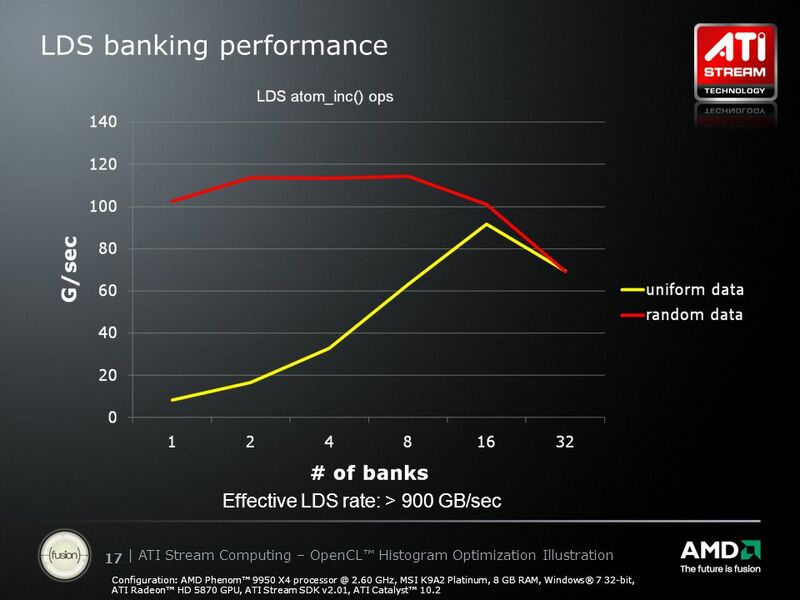 AMD assumes no obligation to update or otherwise correct or revise this information. However, AMD reserves the right to revise this information and to make changes from time to time to the content hereof without obligation of AMD to notify any person of such revisions or changes. 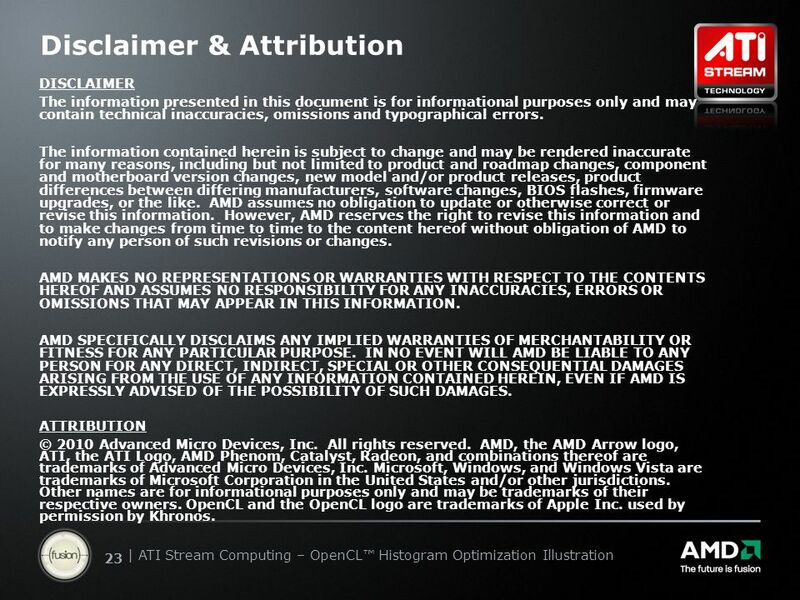 AMD MAKES NO REPRESENTATIONS OR WARRANTIES WITH RESPECT TO THE CONTENTS HEREOF AND ASSUMES NO RESPONSIBILITY FOR ANY INACCURACIES, ERRORS OR OMISSIONS THAT MAY APPEAR IN THIS INFORMATION. AMD SPECIFICALLY DISCLAIMS ANY IMPLIED WARRANTIES OF MERCHANTABILITY OR FITNESS FOR ANY PARTICULAR PURPOSE. IN NO EVENT WILL AMD BE LIABLE TO ANY PERSON FOR ANY DIRECT, INDIRECT, SPECIAL OR OTHER CONSEQUENTIAL DAMAGES ARISING FROM THE USE OF ANY INFORMATION CONTAINED HEREIN, EVEN IF AMD IS EXPRESSLY ADVISED OF THE POSSIBILITY OF SUCH DAMAGES. ATTRIBUTION © 2010 Advanced Micro Devices, Inc. All rights reserved. AMD, the AMD Arrow logo, ATI, the ATI Logo, AMD Phenom, Catalyst, Radeon, and combinations thereof are trademarks of Advanced Micro Devices, Inc. Microsoft, Windows, and Windows Vista are trademarks of Microsoft Corporation in the United States and/or other jurisdictions. Other names are for informational purposes only and may be trademarks of their respective owners. 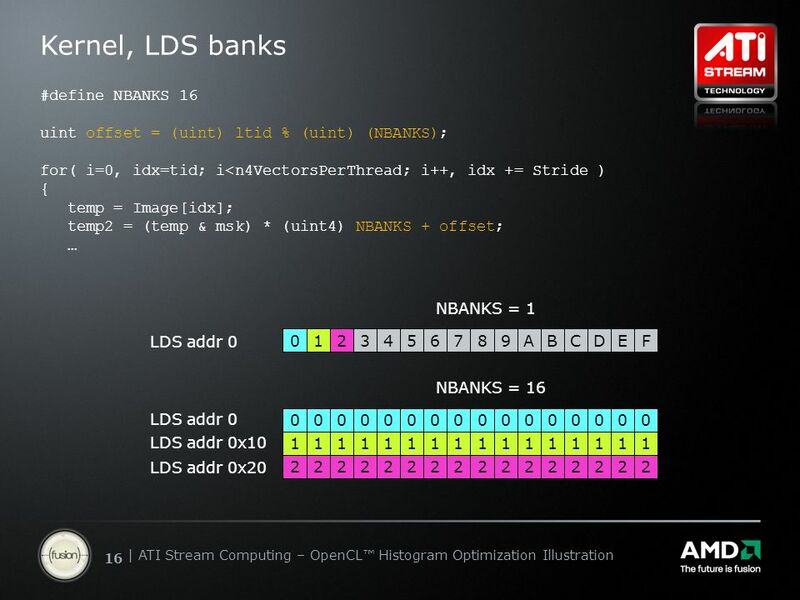 OpenCL and the OpenCL logo are trademarks of Apple Inc. used by permission by Khronos. 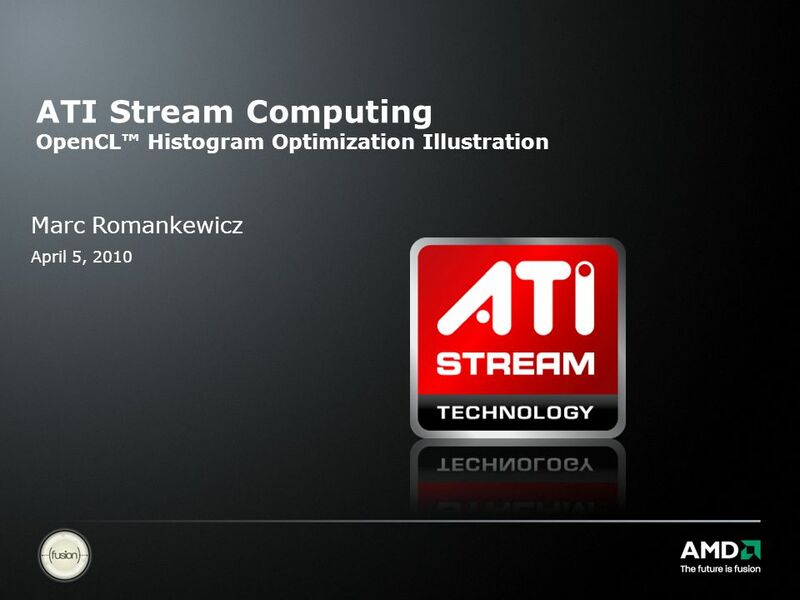 Download ppt "ATI Stream Computing OpenCL™ Histogram Optimization Illustration Marc Romankewicz April 5, 2010." 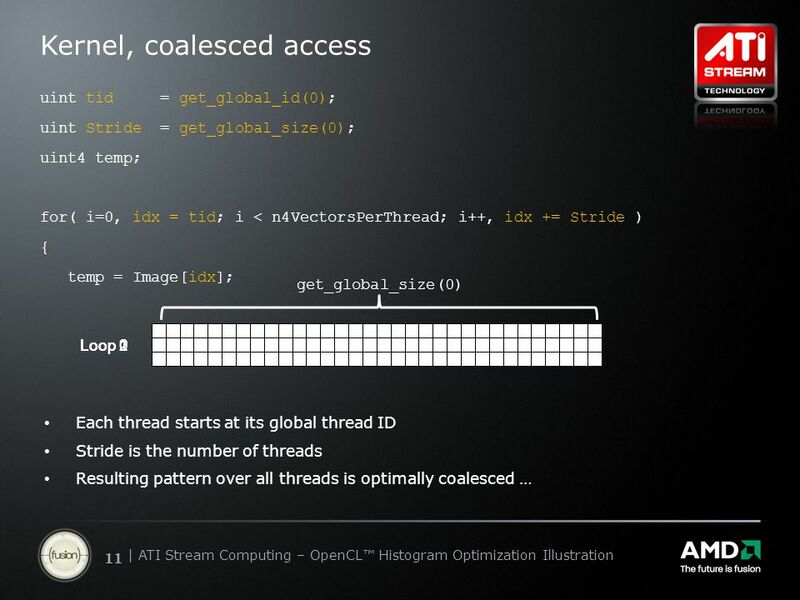 Instructor Notes This lecture begins with an example of how a wide- memory bus is utilized in GPUs The impact of memory coalescing and memory bank conflicts. 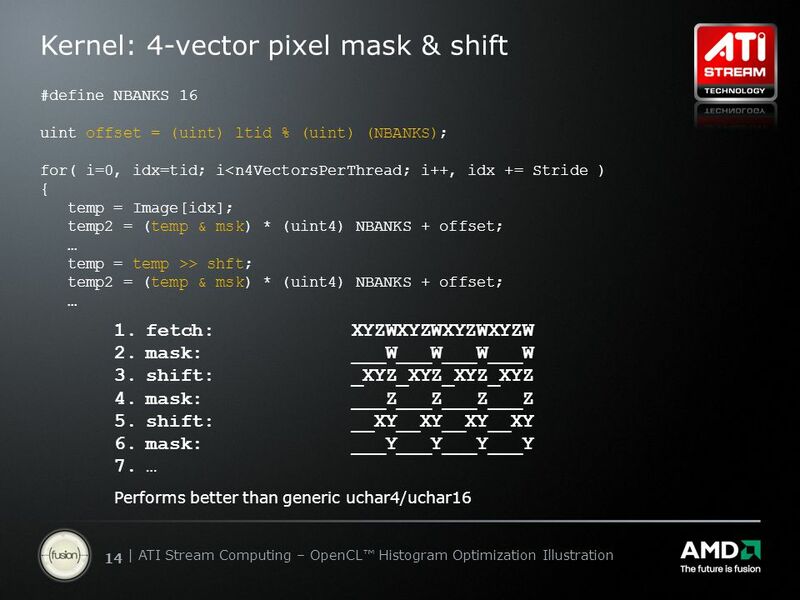 Virtual frame buffer and VSYNC. 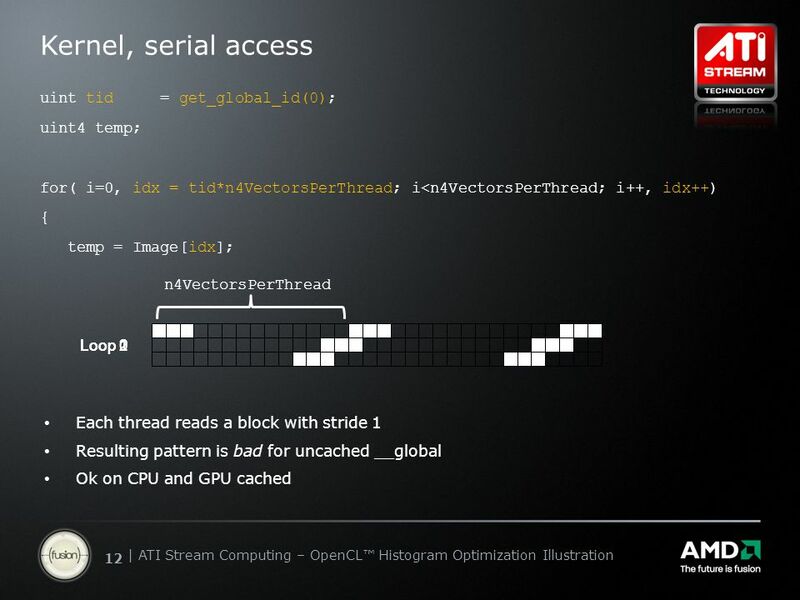 fb on GPU fb on GPU Kernel Vfb on XDR Output request from application mmap /dev/fb Every VSYNC, do; - notify VSYNC to. 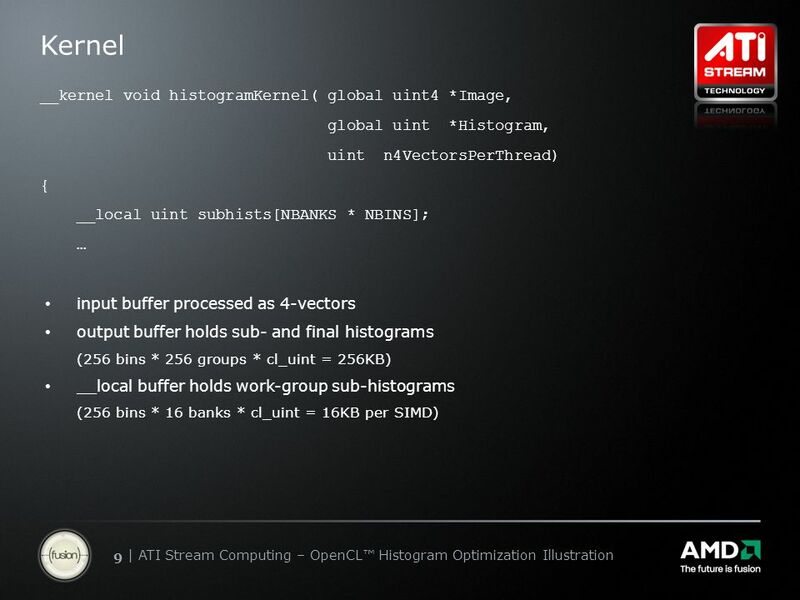 ATI Stream Computing ATI Radeon™ HD 3800/4800 Series GPU Hardware Overview Micah Villmow May 30, 2008. ATI Stream Computing ATI Intermediate Language (IL) Micah Villmow May 30, 2008. 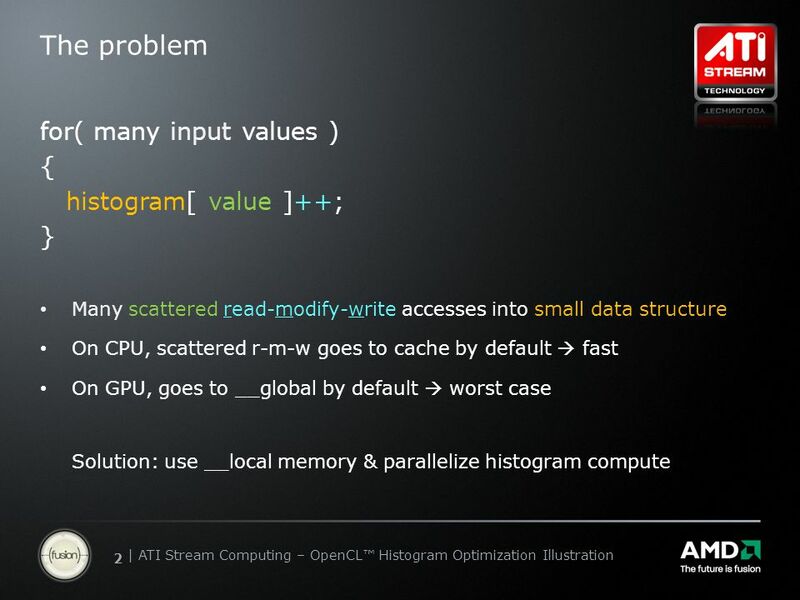 ATI Stream Computing ACML-GPU – SGEMM Optimization Illustration Micah Villmow May 30, 2008. 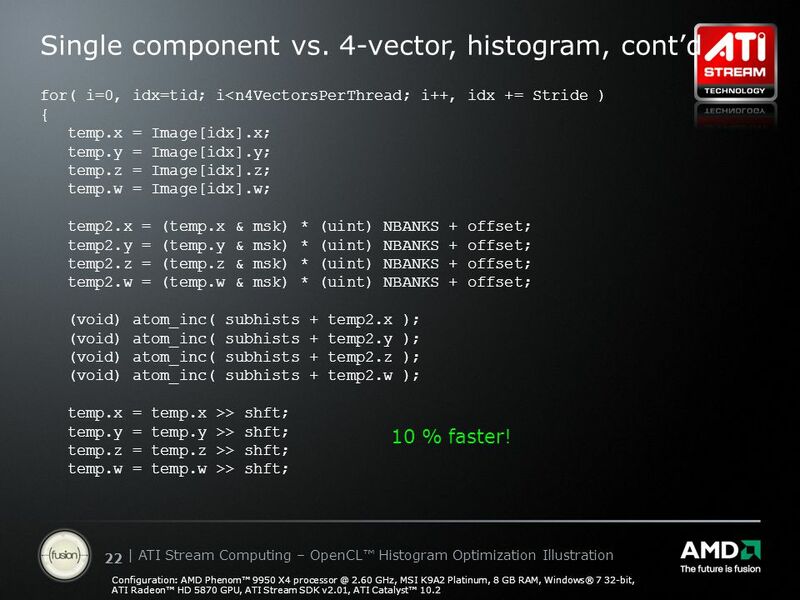 ATI Stream ™ Physics Neal Robison Director of ISV Relations, AMD Graphics Products Group Game Developers Conference March 26, 2009. 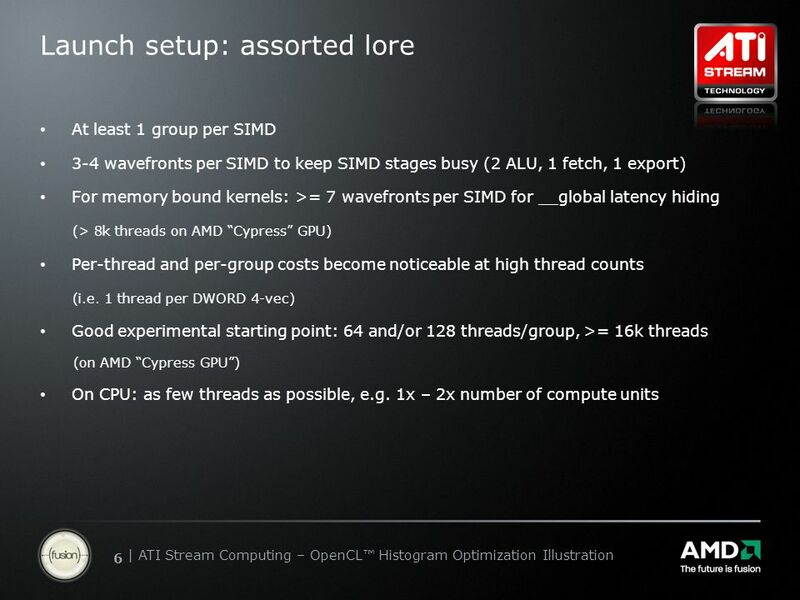 OpenCL™ - Parallel computing for CPUs and GPUs Benedict R. Gaster AMD Products Group Lee Howes Office of the CTO. Cooperative Boosting: Needy versus Greedy Power Management INDRANI PAUL 1,2, SRILATHA MANNE 1, MANISH ARORA 1,3, W. LLOYD BIRCHER 1, SUDHAKAR YALAMANCHILI. Primo Workbook #2 Supplemental Screenshots. 2 Copyright Statement and Disclaimer All of the information and material, including text, images, logos and. EVOLUTION OF MULTIMEDIA & DISPLAY MAZEN SALLOUM 26 FEB 2015. 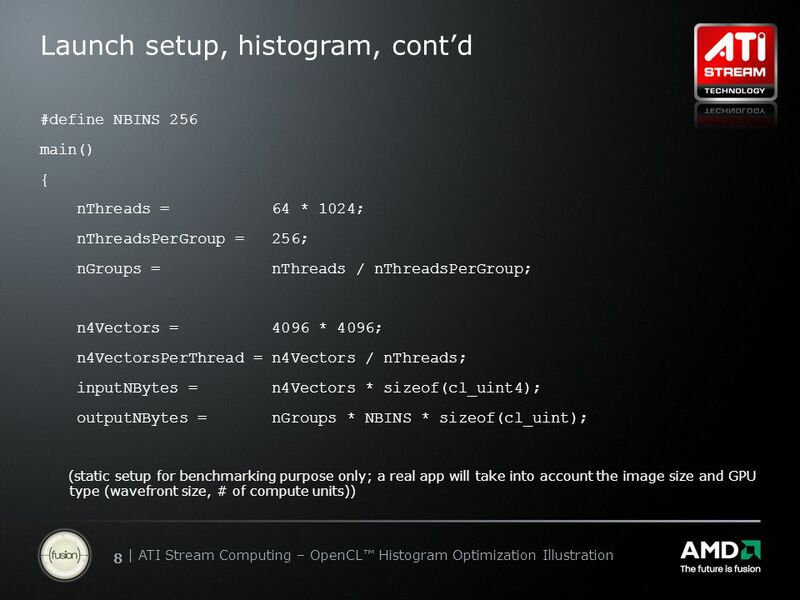 Instructor Notes This lecture discusses three important optimizations The performance impact of mapping threads to data on the GPU is subtle but extremely. Instructor Notes This lecture deals with how work groups are scheduled for execution on the compute units of devices Also explain the effects of divergence. HOLY SMOKE! 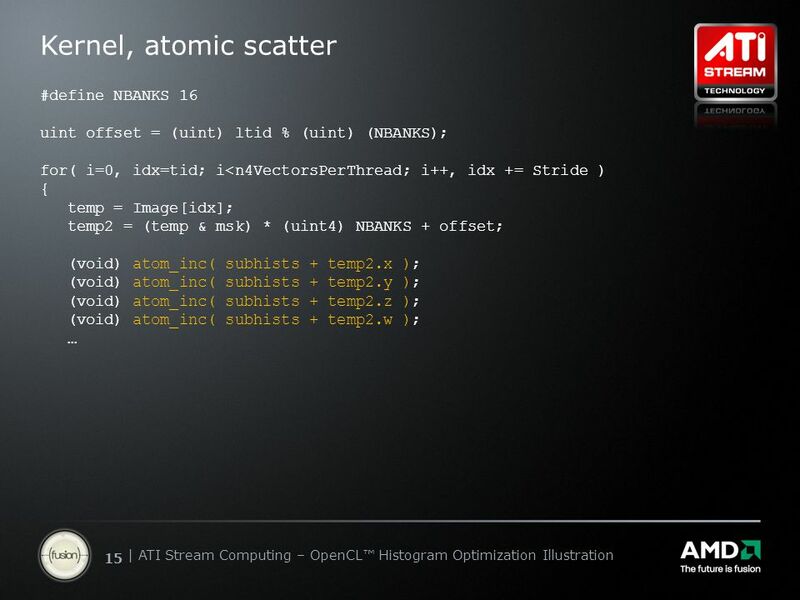 FASTER PARTICLE RENDERING USING DIRECTCOMPUTE AMD AND MICROSOFT DEVELOPER DAY, JUNE 2014, STOCKHOLM GARETH THOMAS 2 ND JUNE 2014. 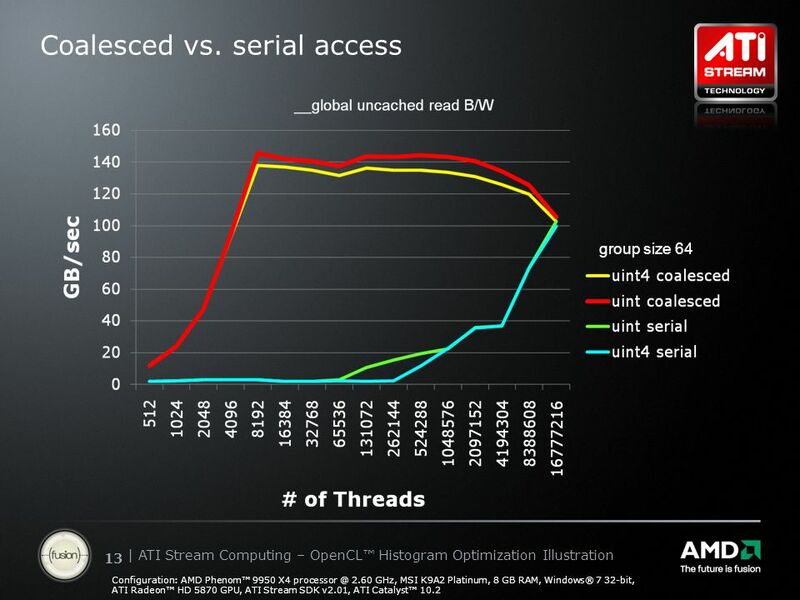 1 The World’s Most Power Efficient Processors Performance and Scalability for Enterprise, Mobile and Embedded Solutions ARM Cortex Processors The World’s. Programming with CUDA, WS09 Waqar Saleem, Jens Müller Programming with CUDA and Parallel Algorithms Waqar Saleem Jens Müller. PPEP: ONLINE PERFORMANCE, POWER, AND ENERGY PREDICTION FRAMEWORK BO SU † JUNLI GU ‡ LI SHEN † WEI HUANG ‡ JOSEPH L. GREATHOUSE ‡ ZHIYING WANG † † NUDT.